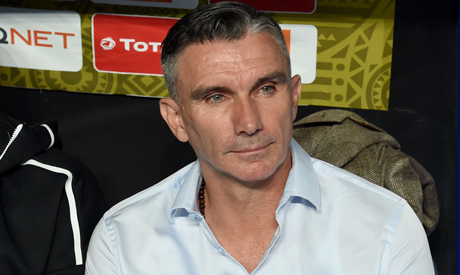 Ahly’s French coach Patrice Carteron told reporters on Thursday that he is staying with the Cairo giants one week after the 0-3 loss of the CAF Champions League final second leg to Tunisia’s Esperance. The 4-3 aggregate result of the two-legged final denied the club a 9th record-extending title of the prestigious competition. “I am staying with Ahly and there will be meetings with the football committee within the upcoming days to discuss a number of matters concerning the team,” Carteron said after a two-hour meeting with Ahly president Mahmoud El-Khatib. “The club president has asked me not to reveal many details about the meeting,” the 48-year-old coach added. The meeting came amid preparations to face the UAE's Al-Wasl on 22 November in the Zayed Champions Cup’s round 16 second leg. The Red Devils will be on the back foot after a 2-2 draw in the first leg in Alexandria on 28 October.